recinto di una forma necessaria l’oscuro peso del colore. Skin Taste goal is the redevelopment of a metropolitan area, that wants to become a new incubator of creativity, with the specific mission of generating a synergy between worlds that are not so distant, such as art, food and wine. 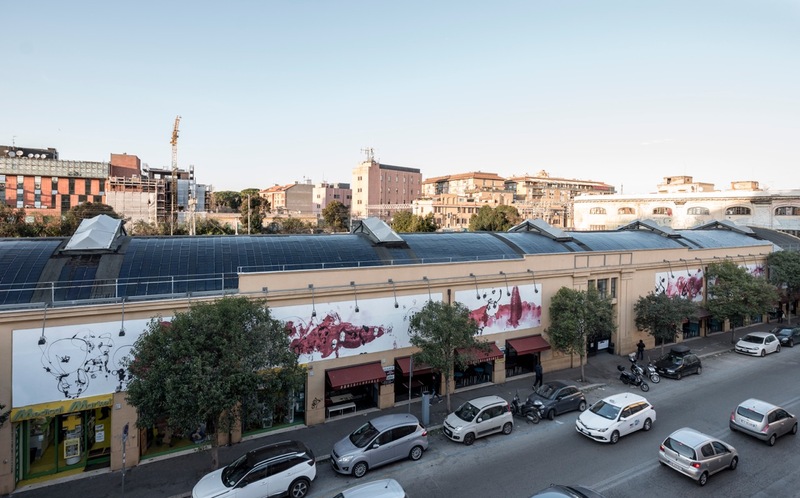 Currently a restaurant but also a lounge and a meeting place, Porto Fluviale occupies the spaces of a shed of the fifties, used over the years as a factory, warehouse and storage area, located between Trastevere, Piramide and Testaccio. An area where an intense phenomenon of urban regeneration took place in the last decade. After Mariangela Levita, Flavio Favelli, Giuseppe Stampone, Igor Grubic | Raffaela Mariniello, this year the interpretation of the “skin” of the former factory has been entrusted to the Roman artist Danilo Bucchi, known for the skill of his large urban interventions, who created the site-specific work Suspected Landscape. With an abstract pictorial sign at first glance but full of silent narrations, Bucchi in Suspected Landscape introduces us into an “another” dimension, in which a barely mentioned figure speaks directly to the unconscious of the spectator. As in a surrealist screen play, the six panels – independent and loose from a spatio-temporal reading – seem to restore an intimate flow of consciousness. In an alternation of plans, iconic hominids of the artist’s language, similar to the twentieth century tradition of psychic automatism, they inhabit a “landscape” interspersed with violent touches of red and punctuated by references to domestic life. Apparently playful but sometimes disturbing, the work of Danilo Bucchi is both dreamlike and realistic, giving the viewer the power of interpretation and perhaps of identification. As Achille Bonito Oliva writes, Bucchi does not fly free in the truth of matter, he does not want to transform art into a practice that cancels the physical gravity of the world … he wants to strengthen it by the foundation of a real, figurable method, capable of extracting a sign, formalizing and circumscribing in the enclosure of a necessary shape is the dark weight of color.